That’s where I left off in part one of Audiology: An Introspection. I realized the can of worms I was opening, but couldn’t avoid it. Audiology is the psychophysical science of auditory perception. You may not agree with that, but that doesn’t change the fact that the term ‘Audiology’ didn’t exist before 1945. The psychophysics of auditory perception prior to 1945 was under the discipline of Experimental Psychology, a branch of psychology that dealt with two seemingly esoteric forms of sound. Absolute and Perceived. The modern day terminology of acoustics has become known as Audiology. Auditory researchers are well aware of this. What wasn’t bantered about back then was how ‘counter-intuitive’ the research was. In the late thirties and early forties Bell Labs was making a name for itself in hearing research, along with several universities and their attached basic science laboratories in psychophysics, such as Cavendish labs. Rewriting Audiology history starts here. And it’s actually not a question of rewriting history, but of recording it (reporting it) under the proper nomenclature. Since I retired from Audiology in 2004, I’ve boned up on modern science, as well as modern physics. I consider myself an amateur science buff, and a serious science writer. Those are not my credentials. My only valid credentials are a California License in Audiology and one in Speech and Language Pathology. That in mind, I’ve been researching where Audiology fits in to the scientific global community of physics. For a practicing audiologist, this might sound like a quantum leap, but I assure you it is not. Audiologists at their very nature are psychophysicists. We study human auditory perception. Our forefathers, in Experimental psychology studied the psychophysics of human perception, as it relates to the neuroscience of consciousness. The vocabulary that audiologists use is the same vocabulary M.D.s use. That threatens some physicians and it should. As you should have gathered by now, science doesn’t really care what it calls itself, as long as peer reviews are done using the scientific method. Again, I’m going to jump out of our ‘Comfort Zone’ and end by saying, modern sciences, like Audiology, will be rewritten in the twenty first century, as we continue to assimilate into intuition the two great revolutionary scientific breakthroughs of the 20th Century, Quantum theory and Relativity. Robert Castleton Wormus got his first Master’s Degree in Special Education of the gifted late in 1964. He enjoyed being a ‘professional student’ for as long as the scholarships and fellowships lasted, which included an AA degree from El Camino, a BA degree in Educational methodology from CSU@LA, a certificate in Astronomy, a minor in experimental psychology, a California teaching credential in Education, Special Education, Speech Pathology, Audiology, the directorship of the CSU@LA’s Associated Clinics, and finally three California licenses in Audiology, Speech and Language Pathology. 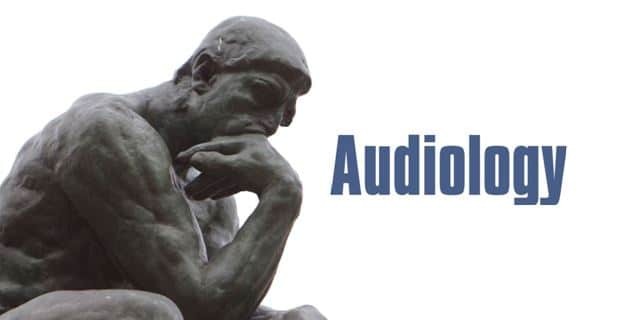 Thank you for taking an interest in publishing my article ‘Audiology: An Introspection. Unfortunately, there’an important correction I would like to point out, and have addressed. At the beginning of the second paragraph is a misquote, “The modern day terminology for acoustics is audiology. I didn’t say that. Acoustics is an official branch of physics, Audiology is the modern day terminology for psychoacoustics. Acoustics and psychoacoustics differentiate the physics of absolute sound, from the psychophysics of human auditory perception. Please correct this crucial misquote.